I am completely obsessed with Instagram. Actually, I think obsessed is an understatement. When I started Googling which celebrities were on Instagram so I can follow them, I surpassed being obsessed. So I was on Instagram today when one of the girls I follow posted how she really wanted Nails Inc “Sweets Way”. When Elissa from LissasPolishAddiction mentioned this polish, I remembered that I had it in my line of polishes to upload. Since this polish was on my mind, I figured I might as well post some swatches and share this fun polish. I got this polish a few weeks ago for my birthday and totally couldn’t wait to put this sweet confetti polish on. 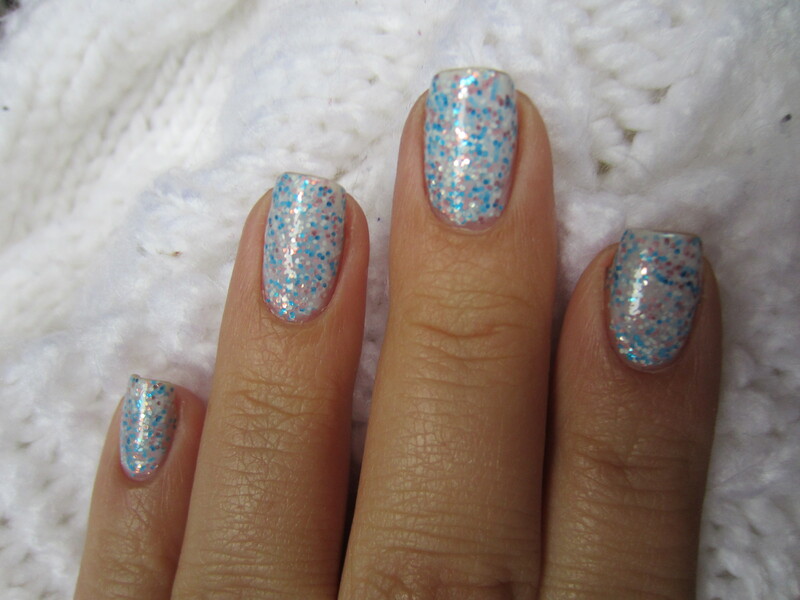 Sweets Way is a milky white polish that is packed with silver, blue and pink glitter. Its apart of the new Nail Inc sprinkles collection and I honestly don’t think there could be a more aptly named collection. This polish definitely reminds me of sprinkles on a cupcake! This is almost like a ready jelly sandwich manicure in a bottle. From far away, you can see that this polish is speckled but once you look up close you get to see just how much glitter there really is. The formula was pretty good as well for how much glitter is in this polish. This is 2 coats and its fully opaque. The dry time was also pretty good, since it is so densely packed with glitter. The only downside is that the milky base is almost too opaque and it gives it almost a matte look. Also, it ate up my top coat and I was left with a semi-gritty texture. I think the next time that I try this polish, I’ll try 1 coat of this over a white polish to see if the glitter pops more. But that is my only complaint and I really think that this is a fun and unique polish. What do you guys think? Do any of you have any of the sprinkles polishes? I love the look of the Sprinkles, but they are definitely a splurge for me. I haven’t tried them yet. Oh yes this one looks LUSH! Thanks for the heads up on the formula!